Edinburgh managing director David Davies will step down at the end of May following "recent media speculation" he described as "unhelpful". The former London Wasps and Queens Park Rangers chief executive joined Edinburgh two years ago. "Sports clubs should be in the news for the excellence of their play, not for off-field matters," he said. Eighth in the Pro12, Edinburgh recently lost to Gloucester in the final of the European Challenge Cup. Davies, who came to Edinburgh with over 25 years leisure, events and sports management experience, said he would support the club in finding his successor. "I would like to thank the staff and fans at Edinburgh Rugby for their support over the past two years," he added. "The playing and coaching staff have made real progress over that period and I wish them all the best for the future. "I am proud to have led Edinburgh, however recent media speculation about my role has been unhelpful as I firmly believe the public interest should be in the team and not the off-field staff. "I would like to thank my colleagues at Edinburgh and Scottish Rugby for their on-going support." 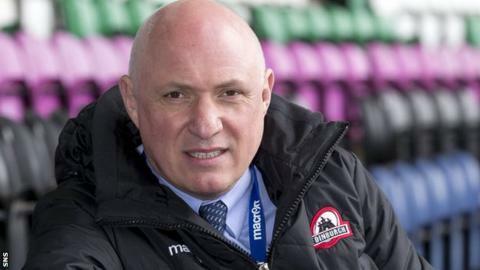 Scottish Rugby said they and Edinburgh "would like to extend their gratitude to David for his dedication and commitment over the past two years". "The club has made considerable progress under his stewardship," the statement added.